Ties between Utah and China run deep: from the contributions of Chinese laborers that helped complete the Transcontinental Railroad in 1869 to former Gov. Jon Huntsman’s appointment as U.S. Ambassador to the People’s Republic of China from 2009-2011, residents of this quintessentially Western state have access to numerous events that reflect the growing importance of U.S. and Chinese relations. In this spirit of mutual cooperation and understanding, the stars have aligned this February so that two compelling exhibitions of modern and contemporary art from the People’s Republic of China now in Utah overlap with the festivities of the Chinese Lunar New Year, February 4 to February 19, 2019, celebrated by more than one billion people worldwide. The viewer will find these two exhibitions at two vibrant cultural institutions that cover the ever-increasing diversity of the Wasatch Front. 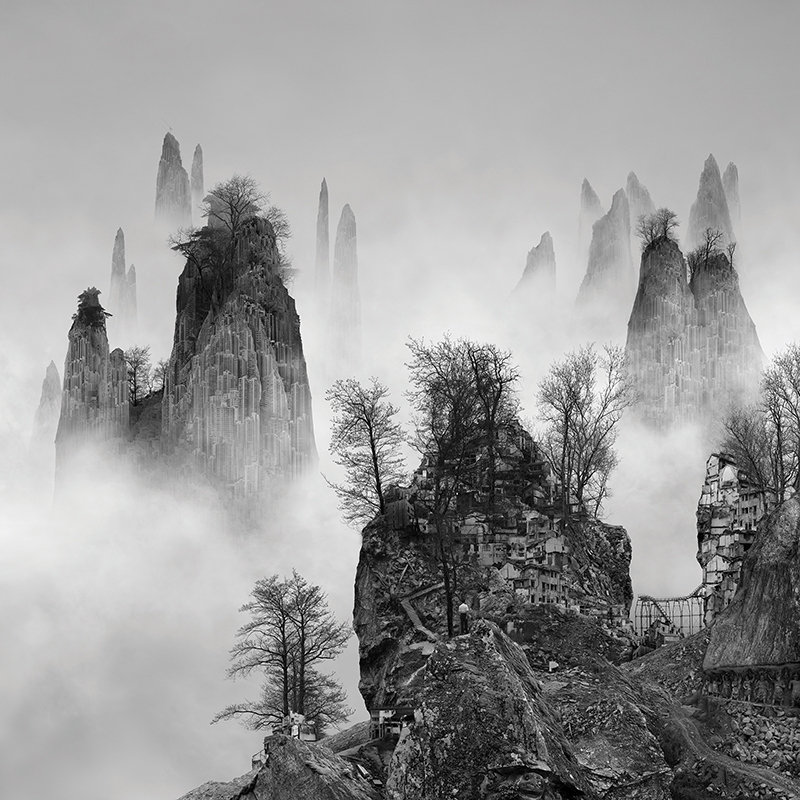 One show, salt 14: Yang Yongliang, which runs from through June 2 at the Utah Museum of Fine Arts, is a concise exhibition of digitally manipulated landscapes from the studio of Yang Yongliang, who the curator Luke Kelly considers a rising star in the crowded field of contemporary Chinese art. The other, Revolution Curated: Original Art of Yan’an’s New Society, 1955-1984, at the Utah Cultural Celebration Center in West Valley City through February 27, is a collector-driven exhibition by Dodge Billingsley, a documentary filmmaker who has visited China over a dozen times during the past two decades. The following conversation among Winston Kyan, Luke Kelly, and Dodge Billingsley occurred in the light and airy UMFA Café on Friday, January 18, 2019. WK: Both of you have rich careers, and both of you are used to wearing many hats. But for the purposes of concision, how would you like the readers to know you. LK: I’m Associate Curator of Collections and Antiquities at the UMFA, which covers a lot of ground. I’m basically responsible for overseeing the archeological materials and Asian art collections at the UMFA. DB: I’m a collector of socialist realist art made in China, Russia, and Vietnam. My day job is directing a production company — Combat Film and Research. My academic background is in International Relations with a focus on War Studies. One might say that collecting the type of art which I collect is an extension of my academic background and professional interests. WK: That’s a lot of ground to cover for both of you – both geographically and chronologically. Luke, let me start with you. I applaud the Yang Yongliang show – and aside from the quality of the work itself, the curation of the material really expands the boundaries of what is “Chinese art.” That is, I feel that the best contemporary Chinese artists seamlessly integrate the long history of Chinese artistic traditions with pressing issues of immediate relevance. Accordingly, your show raises two questions that are at the forefront of our globalizing culture today: first, what role do geographical and chronological labels play in a world of dual citizenship artists who are constantly traveling? And second, how do we interpret the effects of cultural interaction when much of that interaction is done virtually via the internet? WK: I feel that the display of the work also encourages the viewer to be more self-conscious of their viewing habits. That is, one approaches Yang’s large video installation in the gallery traditionally, by first appreciating the monumental outlines of the composition and secondly, the subtle ink tonalities that appear as matter, mist, land and water. It’s only upon very close inspection that the appreciation of brushwork that a traditional viewer would expect and relish has been replaced by a technologically dazzling assemblage of miniscule moving cars, construction trucks, and floating barges. All of the contemplative elements of a traditional Chinese landscape have been co-opted by their modern equivalents in urban sprawl: cypress trees are now telephone poles, texture strokes are now a traffic jam, and a pristine waterfall now looks like the toxic runoff from a building site. LK: Yang does have a complex relationship with technology. For example, in addition to the large video installation, there are five light boxes that invite the viewer to look closely at what are essentially digital images that Yang has rephotographed and redeveloped through analog means. We are basically looking at analog slides of digital images. WK: The artist does seem to suggest that technological progress does not extend much beyond the fleeting sense of marvel that we are conditioned to feel toward the latest gadget. DB: That’s interesting, because my exhibition also deals with progress, and roughly parallels the early years of the People’s Republic of China circa 1955, through the repressive years of the Great Leap Forward (1958-62) and the Cultural Revolution (1966-76), and ends in 1985 when market reforms were opening up society in meaningful ways. WK: 1955 would mark the official state control of all enterprises, and 1985 the year when market reforms in China had become so profitable that GDP was implemented for the first time to measure the Chinese economic development. Fast forward 34 years to 2019, and China currently has the second-largest economy by GDP in the world after that of the United States. Details from four works in the “Revolution Curated” exhibit, courtesy Utah Cultural Celebration Center. DB: The works on display consist of 64 pieces of art done primarily by four prominent artists of the Yan’an Cave Artist group, one of whom, Bejing-based Jin Zhelin, became quite famous for his work. Jin passed away last month. A couple other artists of the Yan’an group are represented but I don’t have a significant number of their pieces. And even though these artists used a variety of mediums, including oils, gouache, and woodblock, I wanted to organize the show not according to artist or medium, but through chronology to show how the artists’ expressions changed from a highly repressive society to one that gradually became more open and free. I feel that the 64 works tell a story of the political and economic experiment of modern China, but it is a story told through art. It’s a picture book of history told not only through the subject matter of the works, but also through the more vibrant use of color and freer brushwork, not unlike the movement from realism to impressionism in the west. WK: We are thick in the middle of the Chinese New Year festivities, which usually last for two weeks. Why should people come see these two exhibits, aside from it being a seasonally appropriate interaction with Chinese culture? LK: I think that Utah viewers will find Yang’s take on urban development echoing with similar concerns about the implications of rapid development along the Wasatch Front. Aside from new headaches over traffic and pollution, there is the very real threat that generic cities have on a sense of community. DG: It is difficult to separate art and politics in communist China, but art is always fun to look at as well, so the political messages are there at your own discretion. I actually believe that a show on modern Chinese art is very much needed in community building because there is a cosmopolitan community here who are eager to learn more about China, and to ask deeper questions about China, such as, is it more a civilization or a nation? China is not something that we can ignore in the 21st century. WK: Thank you, Luke and Dodge, for sharing your insights and perspectives. I hope that readers of this will continue the conversation on their own by visiting both of your fascinating exhibits. 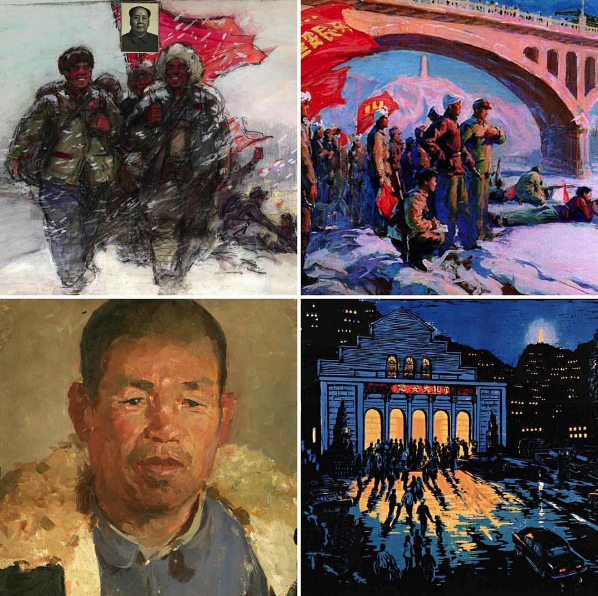 Revolution Curated: Original Art of Yan’an’s New Society, 1955-1984 is at the Utah Cultural Celebration Center, West Valley City, through February 27.
salt 14: Yang Yongliang continues at the Utah Museum of Fine Arts through June 2. Winston Kyan holds a PhD in Art History from the University of Chicago. He is Associate Professor of Art History at the University of Utah, where he offers courses on the arts of Asia and the Asian Diaspora.